I picked up a sample of Acqua di Parma Collezione Barbiere Shaving Cream via Maggard the other day. It came in yesterday. I can't stop sniffing it!! I walk past the den, I walk in and take a sniff. The sample cost me about 9 bucks - this stuff isn't cheap! I might get two shaves out of it I figure being its a cream, but yeah wow, talk about fresh smelling. I mean it smells like mere soap, there's no funky or interesting scent per say, just clean, clean, soap. I'm already planning on adding it to the rotation though... even if it is $80, sigh. It's just so refreshing. Its been a while since I've continually opened a soap to just sniff. It'll be a while before I get to try it on. Sunday/Monday maybe. But I can't wait!! Until that time, I'd love it if you guys would either talk me into it - or out of it. I need to know what's going on with the balm as well. I layer as often as I can. Is it worth the $80 its retailing for? $160 for the two - man, that's not free is it. Let me know. Last edited by earcutter; 08-24-2018 at 01:31 PM. JBHoren, Speedster and Phrank like this. I have a couple of very expensive soaps from EU. I have to say they are very good. Are they four times as good as other soaps from EU? I doubt that I will buy more tubs of soap, but I might buy small sample for every once in a while. Right now I’m not in a soap acquisition era so it’s easy to say no. Id say no. Its soap man! I see no reason to pay that much. It cant be that much better than MDC and the fact its a cream, its not going to last anywhere near as long. Unless your wallet is much, much larger than mine. Who knows. But if it was me, id say forget it. JMO. earcutter and cau like this. I totally get what you both are saying - totally. I am "in a soap acquisition era" though RezDog. It's a problem lol. It just hit out of nowhere. I'm hoping those who have been loving on it pipe up - particularly anyone with experience using the balm. If cost per shave were the only issue in a soaps' worth, we'd all be shaving with Arko. If someone enjoys shaving with fine Italian soaps, aftershaves, and fragrances, whether Acqua Di Parma, Santa Maria Novella, Antica Barbieria Cola, or Boellis Panama 1924, it's worth it to him. 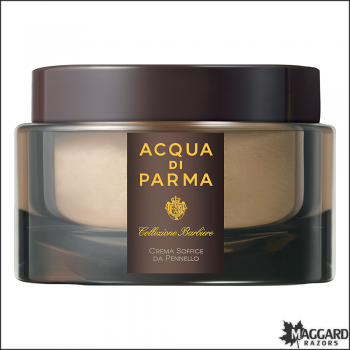 The previous formulation of Acqua Di Parma shave cream had a Colonia scent that most people enjoyed, and they were angered when the new formulation came out that is essentially scentless. However, the new formulation is a marked improvement in the quality of the lather. I enjoy using all of the above products, and don't find ADP to perform any better than the others, and not necessarily better than many other fine shaving soaps and creams that are available today. I would consider it just one of many luxury Italian soaps that might be fun to use, but many people are just as happy using Cella or Proraso. JBHoren, earcutter, BobH and 2 others like this. I thought you had a new different cream sample, doh. The shaving cream is the best you can buy ime. It has menthol smell/feel to it. The balm is kinda crap. I have the Colonia Intensa , purchased in my search for the best. To be fair is ok but its a bit milky where as I prefer the cream type balms..
Another trifecta! Yes, the SC/ASB/EDT trio are certainly worth their cost. I own them, use them (3-4 times a year), and have never once regretted the purchases. The ASB is incredibly soothing and moisturizing, and carries the aroma of the shaving cream. Likewise, the EDT. All three together? A little bit 'o Heaven... right here on Earth. I hate to be that guy but... what do all those acronyms mean? JBHoren, earcutter and jfk742 like this. earcutter, Haroldg48, MikeB52 and 2 others like this.